Rolex’s begrudging dalliance with the world of quartz, while not exactly brief, was certainly unproductive. In the quarter century between the first and last battery-powered models rolling off their production lines, they made just 25,000 pieces. This for a manufacturer that famously builds around 1,000,000 mechanical watches per year. It is fair to say they had very little interest in the concept, seeing quartz as a passing, albeit highly destructive, fad; a storm to be weathered rather than one to be engaged with any more than was absolutely necessary. However, this is Rolex we are talking about, and the brand’s philosophy from day one is that nothing should be done by halves. If their hand was going to be forced by the influx of cheap, reliable and ultra precise electronic watches flooding in from outside, their response, reluctant though it may be, was going to outdo everything else. The upshot was a pair of quartz-driven models based on two of their most successful traditional pieces; known as the Oysterquartz Datejust and the Oysterquartz Day-Date. The calibers inside, the Cal. 5035 and Cal. 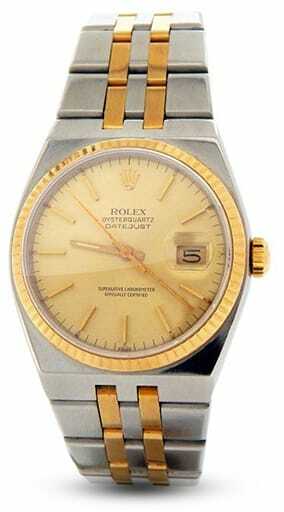 5055 respectively, were the first quartz movements ever made exclusively by Rolex. Yet it was not the first time the brand had been involved with the technology. Several years before they had been part of a 20-strong consortium of Swiss manufacturers, the Centre Electronique Horloger (CEH), which formed in 1962 in a desperate attempt to create a rival to the avalanche of Japanese and American models which had decimated so many traditional watchmaking houses. By 1969 they had created the ensemble caliber the Beta-21, and the following year it was put to work inside watches from a total of 16 different brands, with varying levels of success. For Rolex, it drove a then-enormous 40mm piece called the ref. 5100 Beta-21. While astonishingly precise, with a mean accuracy measured in fractions of a second a day, it is perhaps one of the most un-Rolex Rolexes ever produced. For a start, the awkward shape of the movement meant it did not fit in any of the brand’s existing Oyster cases, and a new one had to be designed, incidentally by none other than Gerald Genta, the man behind the iconic Audemars Piguet Royal Oak. The similarities between the two are glaringly obvious, most noticeably the rugged integrated bracelet. Eye-catching certainly, but not waterproof, the attribute Rolex had first built its reputation on, and definitely lacking in the swooping elegance of previous offerings. Nevertheless, the idea of a quartz watch from the world’s premier manufacture caught the public imagination and all 1,000 pieces of the 5100 Beta-21 had sold out before it even officially debuted at Baselworld 1970. Its generous proportions, and the fact it was only made in either yellow or white 18k gold led to it being nicknamed The Texan, and it was not only the most accurate watch Rolex had launched to date, but also the most expensive. Its time in the spotlight was short-lived though. The quartz movement ran out of power very quickly, but more important, to Rolex at least, was the fact that a mechanism used in one of their watches was also being used in those of more than a dozen competing rands. In 1972, Rolex parted ways with the CEH and locked themselves away in their R&D department, not emerging until five years later. The two Oysterquartz models released simultaneously in 1977 both took their design influences very much from the ref. 5100, but contained new all in-house calibers that were even more impressive. The Cal. 5035 and Cal. 5055 were among the first analogue thermocompensation movements, using an electronic resistor that regulated the frequency of the quartz crystal depending on the ambient temperature. It kept the pair accurate to within an incredible 50 seconds a year. Moreover, and of particular importance to modern collectors, they were so well made they are still serviceable by Rolex technicians today. And on the subject of collectors, the cyclical nature of fashion has brought that archetypal 70s styling back into vogue. Brand devotees are starting to snap up these peculiar examples from the Swiss watchmaking industry’s darkest days, with the extreme rarity making them attractive targets for investors. If you were interested in securing yourself an Oysterquartz watch, the time would be now, and below we will take a look at the details you need to know to make sure you get a great deal. The Oysterquartz Datejust and Day-Date follow pretty much the same pattern price-wise on the vintage market as their mechanically driven equivalents. Of the two, it is the Datejust (the ref. 170XX series) that remains the most accessible, its cost kept lower by both its one fewer complication and the fact it was made available in a stainless steel body. The Oysterquartz Day-Date (the ref. 19XXX), like the traditional President, was forged only from precious metal. However, unlike the original Perpetual version, there was never a platinum quartz model. As the entry-level piece, a steel Oysterquartz Datejust (ref. 17000) starts at around the $3,000 mark. For the moment. As we said, interest in these Rolex anomalies is starting to gather pace, and it would not be surprising for prices across the board to start increasing soon. Two other variants of the Datejust were made, both Rolesor models; one in steel and yellow gold, the other steel and white gold (ref. 17013 and ref. 17014). Of these, the yellow Rolesor is the easier to track down, and with its two-tone color scheme and angular styling, you will struggle to find a more 70s-looking watch! You can expect to pay more than for an all-steel piece, but not by much. The white Rolesor watch, with gold on the bezel and bracelet center links, is slightly more scarce and has, again, a marginal premium. The buy-in point is currently around $4,000, rising to $6,500 to $7,000 for New Old Stock (NOS). As for the Oysterquartz Day-Date, although it was made only in a choice of solid white or yellow gold, it was given a far greater options list during its tenure. The standard pieces, the ref. 19018 (yellow) and ref. 19019 (white) remain the least expensive, but there is a significant gap between them. The yellow gold watch starts off at around $8,000, while that rises to about $12,000 for the far rarer white gold. For comparison, mechanical Day-Dates from the same era are about 10% higher. At the top end, both Oysterquartz models were given diamond accented versions over the course of their production, along with some interesting dial and bezel combinations which we will look at in a minute, that make a rare watch even more scarce, and is reflected in their price points. While nowhere near the sheer scale of variety you would find in the mechanical ranges of either watch, there are still several distinct references in the Oysterquartz series. Starting with the all-steel Datejust, the ref. 17000, each watch was supplied with a polished, smooth bezel and the earliest pieces came in a choice of silver, blue or black dials. 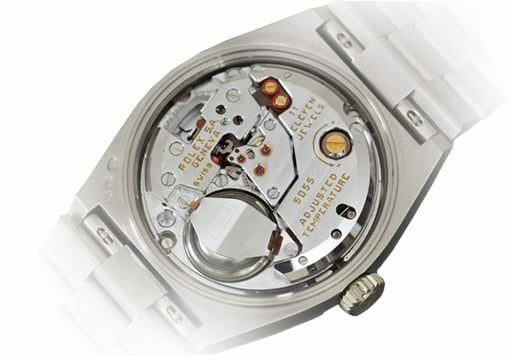 This first generation is sometimes known as ‘pre-COSC’, as Rolex did not initially put any of their new quartz movements forward for certification by the Official Swiss Chronometer Testing Institute and so could not include the standard Superlative Chronometer Officially Certifiedtext on their dial. The alternative nickname of ‘three liners’ also refers to the missing wording on these watches. It was about 18 months into the run, after Rolex had altered the quartz crystal to resemble the shape of a tuning fork, that they submitted them for testing, and these ‘post-COSC’ dials were available in a wider array of colors with, of course, the extra line of writing. There was only one diamond dial for the ref. 17000, on a slate grey example. The steel Datejust was also the only one fitted with the Oyster bracelet, in its unique integrated style, and unusually it, and all the quartz models, carry the same reference number as the watch itself. You can find it stamped underneath near the case back. The ref. 17013 and ref. 17014, the yellow and white Rolesor Datejusts, were given Rolex’s emblematic fluted bezels in their respective golds, and the precious metal was carried over onto the center links of the Jubilee bracelets fitted to both. Again, these were given a broader choice of dial colors following COSC certification, and the ref. 17013 actually had two different types of diamond hour marker dials—one smooth and the other textured. The white Rolesor example had the same single grey option with gemstone indexes as the steel watch. As for the Day-Date, that had a total of 11 different references, some relatively easy to find, others unbelievably rare. The 18k yellow gold (ref. 19018) and white gold (ref. 19019) models were released at the same time as the first of the Datejusts, each on their own variant of the President bracelets, which featured both brushed and polished surfaces. The day disc was offered in a choice of 20 languages and it and the date display came with either white or gold backgrounds, depending on the dial. The dials themselves covered the whole spectrum, both in color as well as in detailing. Hour markers were either simple stick batons or Arabic or Roman numerals. Out of all the Day-Dates, it is the yellow gold ref. 19018 which is most prevalent on the pre-owned market. Two styling versions that are peculiar to the Oysterquartz President, as in, never an option on its mechanical counterpart, are the ref. 19028 and ref. 19038. On these, the center of the bracelets have been fitted with eight tiny pyramids per link, an element continued onto the circumference of the bezel. Some also had pyramid hour markers, and the ref. 19038 was further enhanced with diamond additions, either on the indexes or set into the surround. Later on into the run, the ref. 19048 and ref. 19049 were included in the range. Essentially the same as the standard yellow and white gold models, they included bezels with a total of 44 brilliant cut diamonds. The remaining five references of the Oysterquartz Day-Date are by far the rarest, and definitely the most blinged up. The ref. 19058 has a bezel made up of curved baguette-cut diamonds, rubies or sapphires and was released with some spectacularly iced dials. The ref. 19068 has the same pyramid detailing as the yellow gold ref. 19028, but this time with a completely diamond drenched surround. One model so rare it really only exists as a rumor, the ref. 19078, had a flamboyant multicolored gem bezel much as we saw most recently on the Daytona Rainbow, again on a pyramid bracelet. The ref. 19148 is the same as the ref. 19048, but replaces the pyramids on the bracelet with 12 diamonds per link, making 300 in total. The bezel and case were also heavily infused with the precious stones. And finally, the ref. 19168 was similarly extravagant and had a unique bracelet, sometimes known as the Octopus, with enough unorthodox sprinkling of gems across its surface to make Elvis blush. Only in production for a very short time at the end of the 80s, it would be easier to find a unicorn for sale. Where Rolex’s first foray into quartz movements, the group effort Beta-21, had been too large to fit inside any of their existing dress watch cases, the pair of engines they produced themselves were a different matter. The time and date Cal. 5035 measured 29.75mm x 6.35mm, while the Cal. 5055 shared the same diameter but the added day of the week complication increased its height slightly to 7.11mm. Each was small enough to ensure the Oysterquartz Datejust and Day-Date could stay at Rolex’s favored 36mm, the maximum size their automatic brethren have stuck to until very recently. However, CEO at the time, Andre Heiniger, was adamant no one should mistake the brand’s traditional watch range with the new upstart technology, leading to the unconventional shape of the quartz models. These sharp, angled cases leave both looking significantly bigger on the wrist than their numbers would suggest. There is no difference in functionality between the Oyster Perpetual and Oysterquartz versions of either the Datejust or the Day-Date. Both are three-hand time models, the Datejust with a single calendar complication, the Day-Date with two. The only distinction is in the way each range is powered. Where the automatic models are driven, in essence, by an unwinding spring, the Oysterquartz pieces run on crystals. An abundant natural mineral found all over the world, quartz crystal has long been prized by watchmakers for one unique property; its ability to vibrate at a definite frequency when an AC current is passed through it—what is called its piezoelectric effect. This output from the crystal is converted into pulses that drive a tiny step motor, advancing the watch’s hands through a standard gear train. It is this completely constant vibration rate that makes quartz so incredibly accurate, and in Rolex’s case, their two quartz calibers were light-years ahead of the traditional movements they had been perfecting for decades in terms of timekeeping precision. Ironically though, apart from the necessary electronics, the guts of the Oysterquartz and Perpetual mechanisms were pretty much the same. The entire escapement—bridge, pallet assembly and gearing—in the Cal. 5035 and 5055 was lifted straight from the new 3000 family of mechanical calibers Rolex brought out at the same time. That was the automatic series that introduced the now-standard 28,800vph balance frequency and also debuted the Quickset date function. (Interestingly, the first Rolex watch to officially have a Quickset, as well as a hacking function, was The Texan; the 5100 Beta-21). But while their basics may have been similar, the difference in performance between quartz and spring was vast. Using an oscillator four times faster than that fitted on the Beta-21, as well as a thermistor to govern the quartz frequency against outside temperature variations, it is estimated both calibers deviated by less than one second per week. ‘Estimated’, because Rolex has never published their formal COSC figures. By comparison, mechanical watches could officially wear their Superlative Chronometercredentials by staying within -4/+6 seconds a day—still massively impressive and difficult to pull off, but obviously not even close to the electronic models. It ensured the Oysterquartz versions of Rolex’s timeless Datejust and Day-Date were, and still are to this day, the most accurate watches the brand has ever made. Producing, on average, 1,000 Oysterquartz pieces per year, split across the two separate models and their various different versions, leaves pre-owned examples pretty thin on the ground. That being said, they are not as scarce as you might imagine. 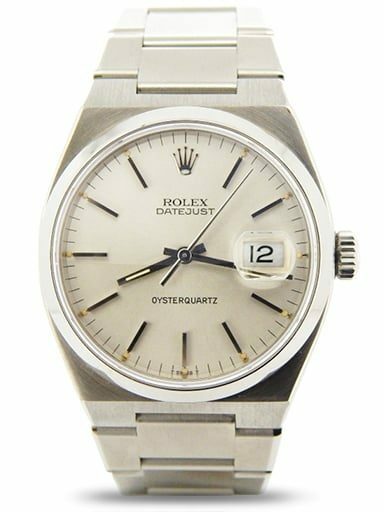 It doesn’t take a great deal of effort to locate a steel Oysterquartz Datejust, for instance, or to afford one for that matter. The yellow Rolesor example (ref. 17013) is similarly plentiful, relatively speaking. White Rolesor Datejusts (ref. 17014), as well as all white gold Day-Dates, are far rarer. 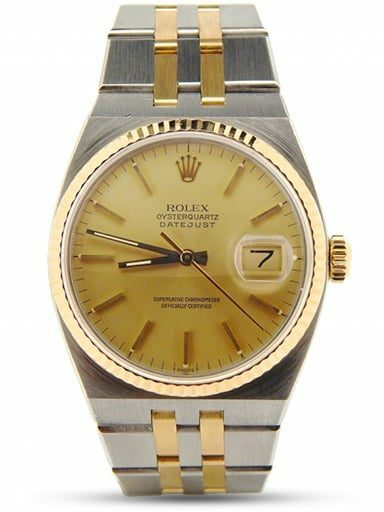 If you remember the Oysterquartz watches were enjoying their heyday in the 70s and 80s, when yellow gold was king and was what the majority of customers wanted, it follows that Rolex were making fewer in white, even in the paltry amounts they were turning out overall. Luckily, modern tastes are once again turning back to yellow gold, and so it is good to know there is at least a reasonably healthy supply of those for collectors to choose from. The ref. 19018, the first quartz President in yellow, is an easy find, while its white stable mate, the ref. 19019, is a little more tricky. Where things get much more problematic, and potentially profitable if you are looking for an investment opportunity, is in securing any of the later versions of the Day-Date we looked at above. Even the most numerous of these models, such as the pyramid-detailed ref. 19028, were produced only in comparatively small handfuls. At best, you will find three or four up for sale at any one time through the usual channels. When you get all the way through to pieces like the rainbow-bezeled ref. 19078, your only real chance of seeing one will be at a highly specialized auction, and probably not even then. These are incredibly rare watches, commanding extraordinary prices. However, Rolex has long had a tradition of creating very limited quantities of several of its more revered timepieces as special orders for certain customers, more often than not those located in the Middle East. These clients can range from rulers of countries to any of a number of different administrative departments. So it is with the Oysterquartz, and you will sometimes come across these historically interesting watches for sale, complete with their specific logos added to the dials. The quartz Datejust seemed to be an especially popular choice, and there occasionally crop up for sale examples with official government insignia, such as a nation’s police force. Prices for these exceptionally rare watches can be surprisingly low, and are well worth a look if you have half an eye on a future asset. Although sometimes seen as an innovation from the 60s or 70s, quartz technology has actually been around since as early as the 1920s. But the first movements were so large—as in, generally needing an entire room to themselves—they were used mainly in laboratory clocks. Yet their potential was plain to see and development continued, leading in 1960 to the commercial release of the Bulova Accutron. This forerunner to true quartz watches replaced the traditional balance wheel with a 360Hz tuning fork, and opened the floodgates for other electronic models to come pouring in, primarily from Japan and America. Slow off the mark, 20 of Switzerland’s finest watchmaking houses banded together two years later to form the CEH (Centre Electronique Horloger) in an effort to create their own quartz movement and stave off the devastation being wrought on their industry. With the combined resources of the likes of Omega, Piaget, Patek Philippe and, of course, Rolex themselves working on several prototypes throughout the decade, the eventual upshot was the Beta-21—the CEH’s first mass produced quartz movement, released in 1969. It was certainly an impressive achievement. The new caliber was accurate to within five seconds a month and, using a micro motor built by Omega, the seconds hand swept smoothly around the dial rather than in jumping increments like the majority of cheap quartz movements. However, its cumbersome size led to unfashionably large watches, and it drained its battery too quickly. The 1,000 units assigned to Rolex went inside their ref. 5100, which sold out in pre-order. It became the first model from the brand to feature the convenience of a Quickset date mechanism and a hacking function, and also the first to swap the former acrylic dial covering with a sapphire crystal replacement. But the Beta-21’s shortcomings and lack of exclusivity led to Rolex parting ways with the CEH in 1972, retreating to Geneva and starting work on their own quartz movement. Five years of development followed before the Cal. 5035 and Cal. 5055 emerged, powering versions of Rolex’s two most successful designs; the Datejust and Day-Date. Both carried the designation Oysterquartz. However, the Rolex of 1977 was not the completely vertically integrated Rolex we know today. Whereas the modern entity makes every component that goes into every watch in-house, back then they had to source elements from manufacturers all over the world. The first generation calibers contained 32-kHz quartz resonators from NDK in Japan, before switching suppliers to Statek in Orange, California, and finally to Micro Crystal in Grenchen, Switzerland. CMOS integrated circuits came from EM Microelectronic, another Swiss company now owned by Swatch, while the batteries came from firms in Germany and the United States. Even so, the Oysterquartz watches required far less expertise and time to construct than their mechanical peers, and were therefore among the least expensive models in the Rolex catalog. They enjoyed excellent sales among those attracted not only by the low price, but also the incredible accuracy and unorthodox styling. Several variations were released, many with outlandish gemstone enhancements, and in the mid-1980s engineers entirely redesigned and updated the movements. New electronics were incorporated, with state-of-the-art circuitry and an improved stepper motor, and the silver oxide battery was discarded for a lithium one. The resulting calibers were named the Cal. 5235 and Cal. 5255, but unfortunately neither went into mass production. Around the same time, the quartz crisis and the public love affair with electronics was beginning to wane. Rolex had continued to produce and relentlessly advance their mechanical watches, and they were now being seen at least as much as status symbols as they were timepieces. Even so, the Oysterquartz watches remained part of the brand’s output until 2001, and were still featured for sale in the catalog as late as 2003. After that, the curtain was brought down on Rolex’s unwilling entanglement with the technology, and has never been raised again. The pair of models it left us with are a fascinating chapter in the company’s story, with an aesthetic unlike anything else in the lineup—one that is becoming evermore appreciated in recent times.